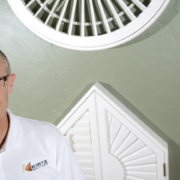 Learn more about the craftmanship and quality that goes into each and every one of our Kirtz shutters. I have awesome floor to ceiling windows, but whats with the half circle at the top? What options do I have? Half Circle Windows, or Round Top Windows were very popular in the US 20-25 years ago. They are a great touch to any room with tall ceilings and in entry halls. Many times a person will move into a home with round top windows, and find that there are no blinds! These are cool windows, but the sunlight is too much. If the previous homeowner took the blinds with them, there are options. There are some different blind options for these type of windows. A basic design is a type of blind that resembles an old hand fan. These are great for minimizing sunlight, are a more cost effective option and come in a variety of materials and colors. Another option are the Sunburst Shutters, custom from Kirtz Shutters. This amazing design is perfect for Half Circle Windows. 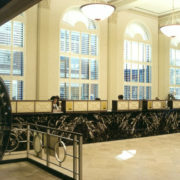 Not only will it be a custom fit for your particular window, but it is also fully functional as well. The curved rod on the Kirtz Sunburst Shutter allows all of the louvers to move together in unison. As with all of Kirtz Shutters, they are completely custom from the design to the color! If you are wondering about this, and other custom shutters, reach out to the folks at Kirtz Shutters, the best in Oklahoma! What is a typical make ready step maintenance staff performs when turning an apartment? Replacing the blinds! In this article we will discuss some of the problems with mini blinds, and alternative options. Mini blinds were designed with the DIY in mind. They are relatively easy to install, and are a cost effective solution. However, you do get what you pay for in the end, and mini blinds aren’t without their drawbacks. Durability – If you have children, or have seen children with mini blinds, you can imagine! Mini blind slats are quite flimsy, and can be pulled out of place easily. If a slat is bent, it will likely have a permanent crease. Another issue is that the cord can become easily tangled. Also, if you have pets that like to chew on things, mini blinds make a great chew toy! Cleaning – Constant cleaning is another one of the problems. If dusting is your dream, it will come true if you have mini blinds. They are notorious for collecting dust. Depending on the types of foods you cook, or if someone is a smoker, this could cause discoloration, staining and grease build up. Options – Among these other problems, when it comes to selection, your options are limited. If you have a room with a custom color, it may be difficult to find mini blinds in the color that you need. It’s almost as if you need to pick blinds first, the design the room around that! However, custom wooden shutters built specifically for your windows, is the best way to go. They do everything mini blinds can do and more. Plus, they’re way more durable. Cleaning is a breeze and the list of options increases dramatically! 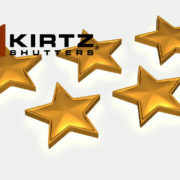 Reach out to the folks a Kirtz Shutters, they are pros at what they do! No to Plantation Shutters? Try Wood Blinds! Wood Blinds: If plantation shutters don’t work for you. Plantation shutters are a great choice for most styles of home. They blend in easily and have a timeless look to them. But not every style or budget has room for plantation shutters. Luckily, if plantation shutters don’t work you don’t have to resort to drapes or bare windows to get by. In fact, in addition to fabulous Kirtz® plantation shutters we also have options for a full range of beautiful, real wood blinds. These blinds can naturally complement to many styles and budgets. It’s the American way to have options right? Out woods blinds make it possible for you to have a variety of styles. You can choose to have your real wood blinds painted, stained, or crafted with one of our specialty finishes. There are a rainbow of colors and design opportunities abound so making wood blinds should be just an unique an experience as custom ordering our plantation shutters. The best part about wood blinds is that they last. Unlike plastic blinds, wood slats won’t bend in the middle if someone decides to tug on them. Wood blinds will outlast any department store blinds by a large margin. The slats are also completely adjustable, making it possible for to keep the blinds closed for ultimate privacy, slightly open to let just enough light in, or totally open to see everything outside. Depending on what color you choose, wood blinds can add warmth to the room you hang them up in or add subtle, quaint charm. So, if plantation shutters just aren’t your thing, consider instead installing wood blinds. We’d be happy to help you decide what design will look and function best for your home project. When your ready to get started, give Kirtz® a call at 1-800-416-6455 today! 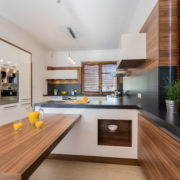 http://www.kirtz.com/wp-content/uploads/2018/02/orange-juice-on-countertop-PACRYXG.jpg 3840 5760 Kirtz http://kirtz.com/wp-content/uploads/2016/04/kirtz-shutters-logo.png Kirtz2018-03-07 08:00:302018-02-20 10:43:22No to Plantation Shutters? Try Wood Blinds!